The image that comes to mind with the word ‘desert’ is of a desolate, dry place of sand dunes and little else. When you visit Saguaro (pronounced “sah WAH row”) National Park you will enter a lush world filled with plants and animals that have evolved to live in a dry, hot climate. Observing these creatures and learning their survival strategies is the most fascinating part of touring this park. The park is divided into two districts thirty miles apart on the east and west sides of Tucson, Arizona. If your time is limited, you should concentrate on one district. They both offer ample opportunities to explore. And there is much to see—58 kinds of reptiles and amphibians, 74 different mammal, and 187 types of birds living among over 610 species of plants. Of course the most spectacular of these is the parks namesake, the giant saguaro cactus. 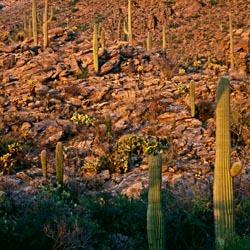 Saguaros grow slowly and may take fifty years to reach six feet in height. They do not begin producing arms for another twenty-five or thirty years. A mature saguaro can grow to fifty feet and weigh eight tons or more. Saguaro tissue is 85% water which it absorbs through a very shallow root system that spreads out from the plant as far as it is tall. This strategy allows the saguaro to survive on limited and widely spaced periods of rain. 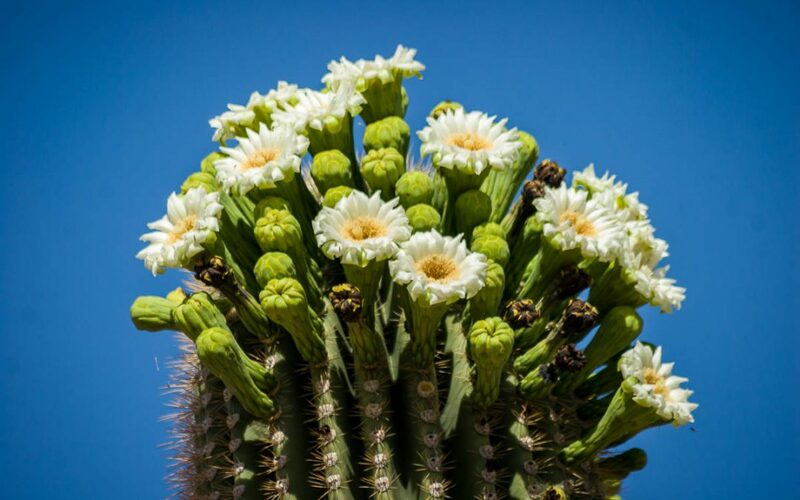 Saguaros begin to produce waxy, white flowers in mid-April, reaching the peak of bloom on Mother’s Day. Flowers open at night and stay open until the following afternoon to facilitate pollination by long-nosed bats, birds and insects. The flowers ripen into a sweet red fruit that contains 2,000 seeds. Over a lifetime, a single saguaro will produce 40 million seeds only one of which will survive to maturity to replace its parent. There is almost always some cactus, shrub or wildflower in bloom but the show is dependent on the amount and timing of rain over the park. This year the spring bloom was sparse due to low rainfall and a late season freeze. The larger of the two districts is on the east side of Tucson. The mountains are higher here with a greater diversity of lifezones. There are 128 miles of hiking trails and six backcountry campsites for those seeking a true wilderness adventure. Stop at the visitors center to view the exhibits and the informative slide show, A Home in the Desert, and pick up guide books. The eight-mile long Cactus Forest Scenic Loop features scenic vistas and pullouts where you can view the great variety of plants and animals that populate the park. 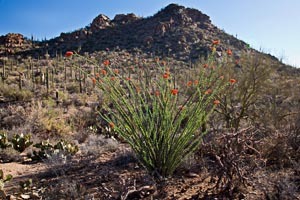 Be sure to stop at the Desert Ecology Trail which offers an up close introduction to the Sonoran Desert. Interpretive signs along the quarter-mile trail detail the adaptations that allow plants and animals to thrive in this rugged environment. My favorite spot for sunset viewing and photography is the Javelina picnic area. Take a short hike up toward Tanque Verde ridge. The hillside lights up with a golden glow as the sun sinks behind the distant mountains to the west. Saguaros and teddy bear chollas seem to glow with an inner light. Use a wide angle lens to capture the panoramic beauty and then switch to a telephoto to isolate details. 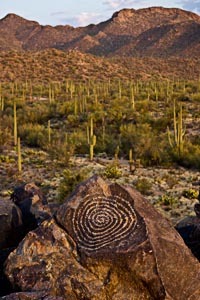 Begin a visit to the western half of Saguaro National Park at the Red Hills Visitors Center. Take the time to view the slide show called Voices of a Desert which describes the desert from the Native American perspective. There are also two short nature tails at the visitors center to introduce the habitat you are about to explore. Just down the road is the Desert Discovery Nature Trail which will familiarize you with the ecology of the Sonoran Desert. For a closer look at the foothills of the Tucson Mountains, take the five-mile long Bajada Loop Drive. This unpaved road has a primitive feel to it although it can be easily navigated by passenger car. There are two picnic areas and a short overlook trail along the drive, all three of which are worth a stop. The Sus Picnic Area is surrounded by hills and and dense desert vegetation. Take a picnic lunch and relax for a while to soak in the beauty around you. The Valley View Overlook Trail is less than a mile riundtrip, passing through two washes and ascending to a ridge where you have a view of the Avra Valley to the west of the park. If you only have time for one stop, make it the Signal Hill Picnic Area, especially late in the afternoon. From the picnic area, a quarter of a mile trail will take you to a rocky hilltop where you will find dozens of ancient petroglyphs. These markings on the rocks where created over 800 years ago by ancestors of the Tohono O’odham people who still live in this area. Their true meaning has been lost to antiquity but it is fun to speculate on what was in the mind of their creators. Of particular note is the large spiral that may be an astronomical symbol to mark the passing of the seasons. I have to admit that I usually skip visitors centers and paved nature trails when I visit a national park. I’m anxious to head out to more remote areas to photograph. However, when I recently spent the day in Saguaro National Park, I decided to check out all of the areas most popular with travelers. I’m glad I did. Reading the interpretive signs while actually seeing what was being explained give me a new understanding and appreciation of the desert ecosystem. So my final piece of advice is to take a few minutes to view the slide show at the visitors center and hike one of the nature trails. It will make for a richer experience when you explore the rest of the park. 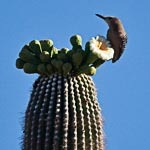 Go to the Saguaro National Park website for more information on touring the park. For information on more sights to see along US Route 89, go to the Tucson to Apache Junction Road Trip Guide.